Life is a bed roses with new sugar free Fitch & Leedes Pink Tonic. Bringing you all the taste without the sugar, it is the perfect fit for a low kilojoule G&T when paired with a masterly crafted premium gin. Pretty in pink with whiffs of rose petals and fresh cucumber, new sugar free Fitch & Leedes Pink Tonic is a delightful alternative without compromising on taste. Fitch & Leedes tonics pride themselves as the understudy to greatness, accentuating the botanical character and subtle notes of handcrafted gins. Understanding the time and effort put into perfecting premium gin, Fitch & Leedes tonics are delicately carbonated and finely balanced to ensure the best taste representation of what was intended by the master distiller. 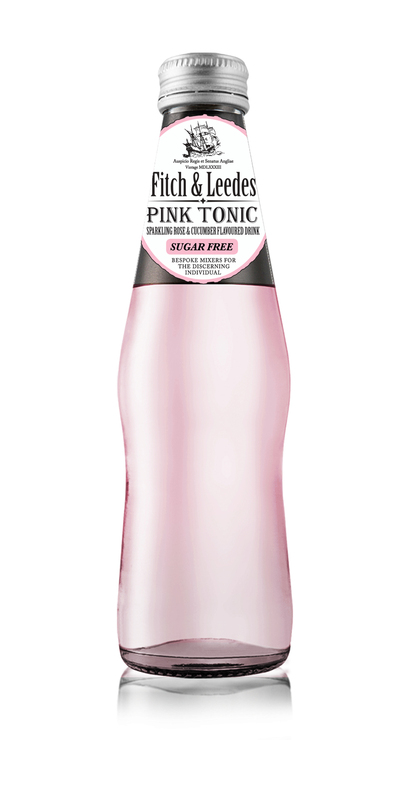 Let new sugar free Fitch & Leedes Pink Tonic take you back to an era when things were still made with the utmost care and craftsmanship. Inspired by the intrepid gentlemen merchantmen of London, Ralph Fitch and William Leedes, who set sail on De Tyger in 1583 in search of new, exotic tastes in India and the East, Fitch & Leedes speaks of the romance and integrity of a bygone age. Fitch & Leedes can be found at leading purveyors of fine beverages, boutique wine shops, selected deli’s, fine dining establishments and cocktail bars at around R50 for a 6-pack of 200ml cans or R52 per 4-pack of 200ml glass bottles. For more information about the Fitch & Leedes range, contact James Shaw at Tel: (+27) 021 886 8842, Fax: 021 887 1005 or send an email to info@chillbev.co.za.